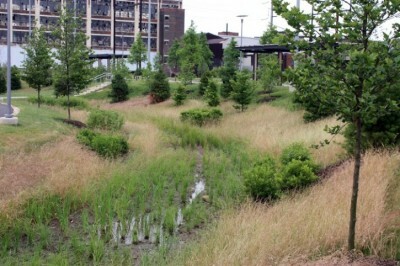 Rain Gardens are one of the most exciting concepts to emerge in landscape design. They are generally small-scale designed features that capture and withstand extremes of moisture and concentrations of nutrients that are found in stormwater runoff. A depression or low lying area corrals stormwater and in the process reduces or slows runoff. What makes it a rain garden is how the water is captured and what happens to that water once it arrives in the garden. Infiltration of the stormwater runoff helps to cleanse the water and return water to a site. Rain gardens, if done properly will have a positive effect on both the volume and quality of stormwater run off. While the use of natives should be promoted it must also be noted that a lot of 'native plants' are used way beyond their region. What is frequently sold as natives at many of the local nurseries, are frequently plants from distances as far as a thousand miles away and further, with the native connection in the publics perception being one of state and nationalistic origin as opposed to origin within a specific plant community. The question of whether introduced plants should be used along with natives must be given more consideration for the simple reason that because a plant is not within our state or national boundary does not mean the plant cannot have ecological value to the garden. Of course the use of introduced plants must be carefully considered so that invasive one's are eliminated from the potential list of what is acceptable. Unfortunately, I have seen more poorly designed rain gardens than good ones. In the City of Lancaster, a rain garden on the west side of town resembles a collection of native plants with little thought for the design. The result is a space that lacks coherence and has a poor image among the public. We must be careful that ecologically inspired design keeps people in mind. The question of design from a functional and aesthetic perspective must be considered, and if done properly it will serve the ecological function it was intended for as well as potentially becoming a restorative scene for the public or client.